Designed for high bandwidth use, the ZyXEL PLA5256 Powerline HD adapter offers a simple solution for home networks facing wireless coverage difficulties. The ZyXEL PLA5256 provides gigabit speeds to strengthen your home network without adding any extra cables. Simply plug in the PLA5256 to your outlets and connect to your network devices to extend your Internet access. With the latest Homeplug AV2 technology, enjoy speeds up to 1000Mbps and backward compatibility with older Homeplug AV products. 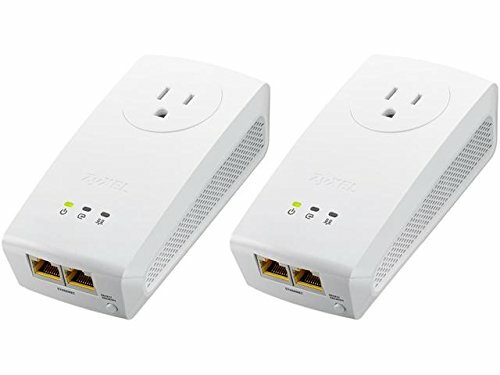 Two gigabit Ethernet ports are included for connecting multiple devices so you can use wired connections to improve reliability and coverage on all your smart devices. Expand your coverage in a few simple steps and enjoy a faster network with the new ZyXEL PLA5256.